Our season really started with Garvy Beh[M] heading off to Argentina to play in the Copa Potrillos. Garvy played outstandingly well in helping his team to win this very prestigious tournament. His handicap in Argentina was subsequently raised to 2, so huge congratulations to him! Unfortunately Garvy damaged his wrist in this tournament and so missed the first few games of our season. However, the A team of Andreas Papoyans[L], Luke Walsh[BI] and Hugo Singh [Wc] still managed to beat both Marlborough and Millfield in fine style in January. 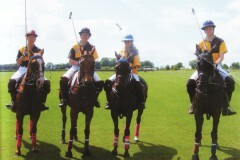 The same team followed this up with a good wins over Harrow and Eton.